Sunshine and some clouds. High 84F. Winds SSW at 5 to 10 mph.. Doctorate candidate Reza Riahi is among the 23 University of Arizona students working an internship at Ventana Medical Systems/Roche. He is helping to evaluate a third-party company’s technology to identify and analyze cancer tumor cells. 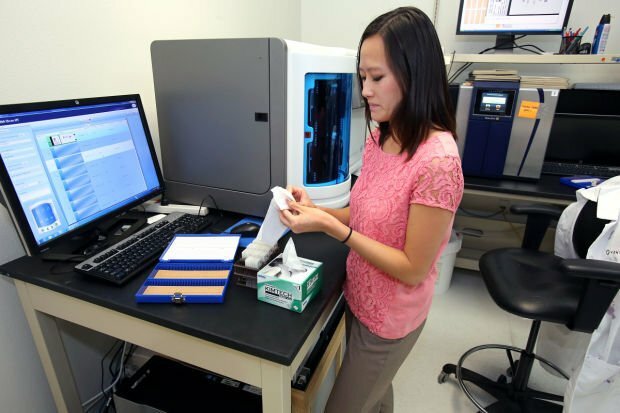 Tam Nguyen, a returning Ventana intern, is a UA senior in biomedical engineering who says, “I feel like I’m really making a difference.” Her work involves helping pathologists develop more consistent readings of test results. While many college students will spend this summer catching some waves, some University of Arizona students are catching the next wave in medicine. Thirteen students from across campus are among 23 students who recently started paid summer internships at Ventana Medical Systems/Roche, which makes instruments that automate tissue analysis primarily for cancer. Twenty-one of those interns are working at Ventana's Oro Valley headquarters for the 12-week program; two others are at the company's site in Mountain View, Calif. It's an opportunity for students in a diverse range of disciplines to earn while they learn about career paths they never envisioned, said Jim Godsey, senior vice president of product and technology development for Ventana. "It's an opportunity to bring these young people in, let them be exposed to the hundreds of career paths that they could pursue, and let them see how they can use their skills, to apply those, to improve the lives of patients afflicted with cancer," he said. Besides the 13 UA undergraduate and grad students, four interns are from Arizona State University, and there are one each from six other schools, including UCLA, Case-Western Reserve in Cleveland and a university in Lorrach, Germany. It's a very competitive gig: About 600 students applied for the full-time internships, which generally pay $18 to $22 an hour. Once they arrive on Ventana's campus in Oro Valley, the interns aren't sent to the mailroom. The students - including several returning summer interns - work on many of Ventana's latest projects, Godsey said. "They get to work on something that's relevant to the company, that's current, and we get to evaluate new talent," he said. The company was founded in the mid-1980s by UA pathologist Dr. Thomas Grogan, who designed an automated tissue slide-staining device to speed cancer diagnoses. Ventana, which was acquired by Swiss drug giant Roche in 2008, still makes its slide-prep devices and related products, but it is moving into creating so-called "companion tests" to screen patients for their potential to respond to specific therapies. "That approach has revolutionized the pharma industry and made us that much more valuable to the Roche group," Godsey said, noting that its companion tests are designed to be used with Ventana's installed base of thousands of slide-staining instruments worldwide. One of the UA interns, doctorate candidate Reza Riahi, is helping to evaluate a third-party company's technology to identify and analyze cancer tumor cells that circulate in the blood in small numbers. 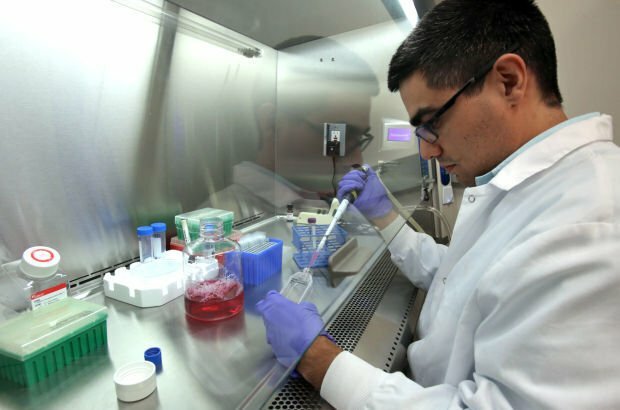 Riahi, 33, earned his bachelor's and master's degrees in mechanical engineering in Iran and applied for the Ventana internship through Bio5, the UA's interdisciplinary biotech institute. Riahi worked on creating microscopic channels to trap the so-called circulating tumor cells at the UA. At Ventana, he's working out a method to remove the trapped cancer cells and transfer them to a Ventana instrument for analysis of cell behavior. "Part of it, I can apply my experience and skills and part of it I learn from people here, so it's real-world," said Riahi, who was interested in a medical career but admits to a history of fainting at the sight of blood. Returning intern Anna Lueck, a 20-year-old senior majoring in chemical engineering, is working to help move Ventana's developmental products to the manufacturing phase by analyzing test results from chemical test fluids known as reagents. "I'm collecting data to see how well the tests that are used to make the final products are performing so the processes can be improved upon," Lueck said. While she enjoyed doing academic research on protein structures, Lueck says she finds Ventana's focus more rewarding. "I wanted there to be a deeper purpose to the research I was going for, something a little more obvious," the Catalina Foothills High School graduate said. Returning Ventana intern Tam Nguyen, 21, a UA senior in biomedical engineering, helped write a program to detect defects in slides last year. This year, she's assessing staining on tissue to help pathologists develop more consistent readings of test results, seeking to automate the process with computer algorithms that take into account where pathologists look and the levels of colors used to stain samples. "It's exciting to get an answer to homework problems, but here, I feel like I'm really making a difference," Nguyen said. Ventana's only finance intern, Ryan Compton, 23, a second-year Eller College MBA student, said his work analyzing budgets, pricing and forecasting could be done at any company. But the medical field interested Compton because his father was a doctor, and Ventana's mission is personal since two of his relatives died of cancer. "It's just a little more rewarding when you know you're working with a group of people who have a common goal of making the world a better place and striving to improve the lives of those with cancer," he said. While the interns get invaluable work experience and stipends from Ventana, they contribute more than their skills, Godsey said. "I think what they bring is what I call 'fresh young minds' approaches," he said. "They challenge us in ways we often never expect, and by challenging the status quo, by looking at it with a fresh set of eyes, they open up opportunities for more innovation." The Wildcat Job Listing can be sorted for internship attributes, including location and type of position. Students pay a $5 annual fee to use Career Services programs. • Internship programs are available to students of other local schools, including Pima Community College. A map of the locations of Tucson technology that made the news in 2013.